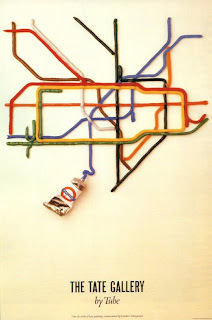 I was flattered to be contacted late last year by the curator of the Collections Department of The London Transport Museum, who wanted to interview me on the inspiration and motivation behind the 'Tate by Tube' poster which will be featuring in their major 2012 exhibition - Mind the Map. Reaping a number of industry awards and accolades back in the days of its first issue, 'Tate by Tube' is reportedly the best selling poster in The London Transport Museum Shop. A great testament to a simple witty idea, well executed and created the year after I graduated in my first job at The Fine White Line, (happy days). My 'Old Faithful' has always been a great door opener, conversation starter, (and job getter) and I'm proud and delighted it's appeal has not dwindled over the years as it approaches its 25th anniversary. The curator informed me that it had even been a major influence on a second, more recently commissioned poster, the Rorschach Test map by the artist Cornelia Parker. Mind the Map opens 18th May - 28th October 2012 at The London Transport Museum where the original three dimensional map model will be on display as part of what will be a fascinating exhibition. Try to squeeze in a visit. imalat montak, sineklik montajı ve imalatı yapmaktayız. firması sizlere en uygun fiyatları sunmaktadır.